The NUTRITIONAL line of TRICHODEX responds to the nutritional needs of the crops in different phenological states, offering solutions respectful with the environment. 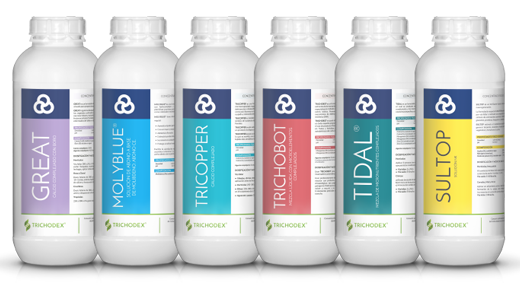 These are high solubility formulations, with a quick action and high efficiency, designed for different nutritional needs of the crops, conditioning of soils and water, solving specific deficiencies or participating in integrated nutritional strategies. 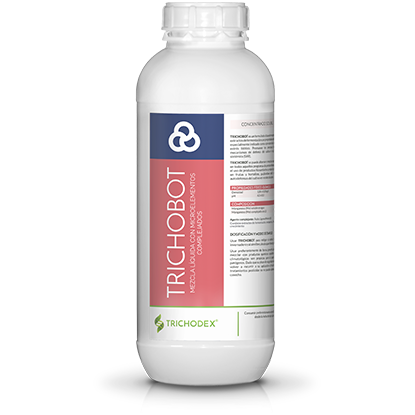 Biorooting products of TRICHODEX helps the activation of the root system, which favor the growth and strengthening of primary and secondary roots favoring the absorption of nutrients when the plant needs them the most. Biorooting product recommended for indoor and outdoor horticultural crops, seedbed and nursery plants. To get a bigger development and activity of the root system of the crops, ensuring the rooting even after the transplant. Products with a nutritional base and high content of bioactive elements from microorganisms that elicit the natural defenses of the plants. Specially in flowering. Reduce the stress before the flowering period, to help boost the induction and the number of flowers, and to secure the ripening of the fruits. Recommended in citrus, banana, fruit and olive trees, as well as indoors and outdoors horticultural crops. Product specially recommended to ensure the process of ripening in horticultural crops, olive, fruit trees, citrus and vineyard. With a foliar application after the petals fall, it improves the photosynthesis, the metabolic and enzymatic activity of the plant. Increase the yield and the quality of the fruits. Liquid and clear formulation based on Sulfur with a systemic action. Does not spot the fruit. Both foliar and soil application to control the powdery mildew and the red spider diseases in indoors and outdoors horticultural crops, strawberry, fruit trees and tropical crops. Formulation based on fast-absorbing and assimilating Potassium to improve the ripening processes in horticultural crops, table grapes, and fruit and citric trees. Product free of chlorides, carbonates, sulfates and phosphates. Liquid corrector that prevents and corrects Boron deficiencies. Complexed with ethanolamine, it is quickly absorbed with both foliar and soil application in horticultural crops, strawberry, and fruit and citrus trees. 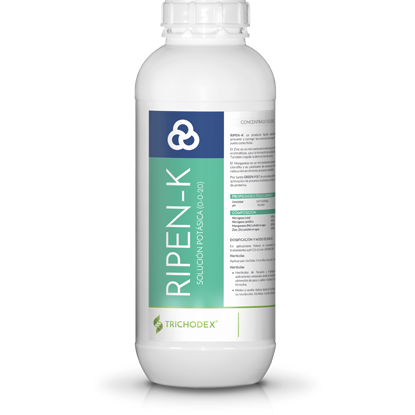 Solid formulation based on Phosphorus and Potassium with microelements (Boron and Molybdenum), with soil application before flowering until ripening. Recommended for cucurbitaceous, tropical and ornamental crops. Liquid formulation based on chelated Iron, Manganese, Zinc and Copper as well as inorganic, water-soluble Molybdenum, recommended to correct deficiencies and phisiopathies in leaves and fruits of all types of crops with a foliar and soil application. Micro-encapsulated Copper Gluconate, recommended to control fungal and bacterial diseases in olive tree, vineyard, citrus and fruit trees, horticultural crops, avocado and papaya through a systemic and rapid assimilation with a foliar or soil application. Corrector with calcium and boron complexed with gluconic acid, that ensures and ease the availability of these elements in the plant with a fast absorption. Foliar and soil application. Product free of chlorides, sulfates and nitrate. Micro-granulated and solid product with a high solubility, recommended to correct deficiencies of iron in soil. 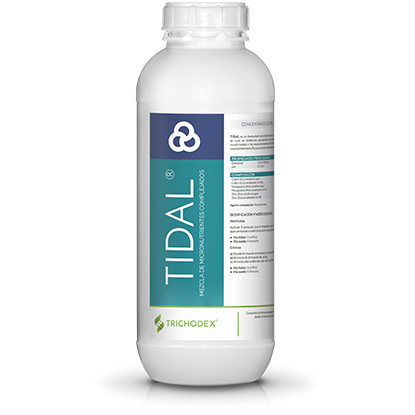 It is chelated with EDDHA in perfect orto-orto and orto-para balance to provide stability, availability and absorption of iron to those soils with a high pH. Calcium corrector recommended for saline or acid soils, or those with permeability problems. It acts releasing and providing calcium to the plant. This product is recommended for all types of crops. Product free of chlorides, sulfates and nitrate. Specific product that increases the Brix degrees of the fruits from maturity to harvest, improves its quality and favors the color change. Indicated in all types of crops. Applied via soil in fertigation. Solutions oriented to improve the conditions of the soil, improving the structure and its composition, the microbiological activity and reducing the salinity. 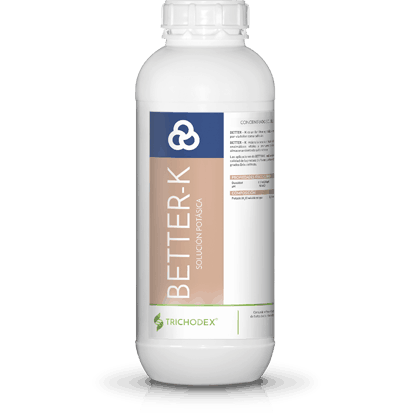 Improves soil aggregates, psycho-chemical characteristics, fertility and nutrient absorption. 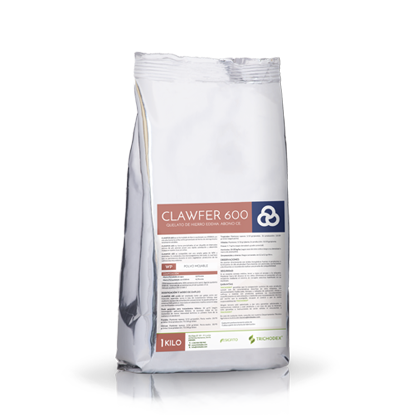 It also increase the capacity of water retention, cation exchange (CIC) and the activity of the microflora, promote the rooting of the seasonal and perennial crops. Product indicated to desalinize soils with high sodium content, which reduces electrical conductivity (EC) and percentage of exchangeable sodium (PSI). It is also used to desalinate irrigation water. Improve the physical, chemical and biological soil structure. 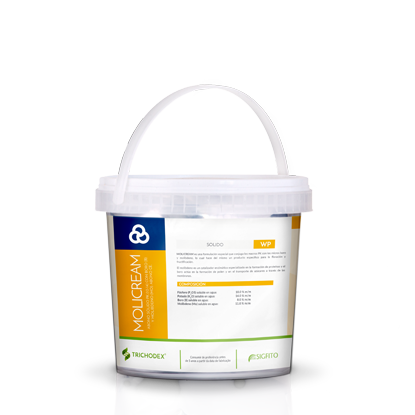 Especially indicated to increase cation-exchange capacity (CEC), and to improve the activity and development of soil microorganisms. Long-lasting product in soil. It improves the rooting of the crops and the structure. Acts immediately, activating the microorganisms of the ground and stimulating the root development of the cultures. Product of high stability and miscibility in the application by its formulation and pH 10. Biotechnological formulation enriched with specific microelements, which activates different defense mechanisms in the plant. 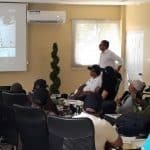 Reduce the impact of different biotic factors, especially caused by Phytophthora, Botrytia, Monilinia, Anthracnose and some bacterial diseases in almond trees, fruits with bone and horticultural crops. 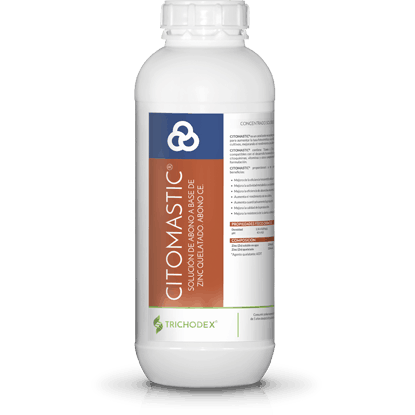 Biotechnological and fermented formulation that reduces the impact of some biotic factors, on roots caused by Phytophthora and on leaves caused by Anthracnose and Olive peacock spot. Recommended for citrus and olive trees, horticultural crops and strawberry.